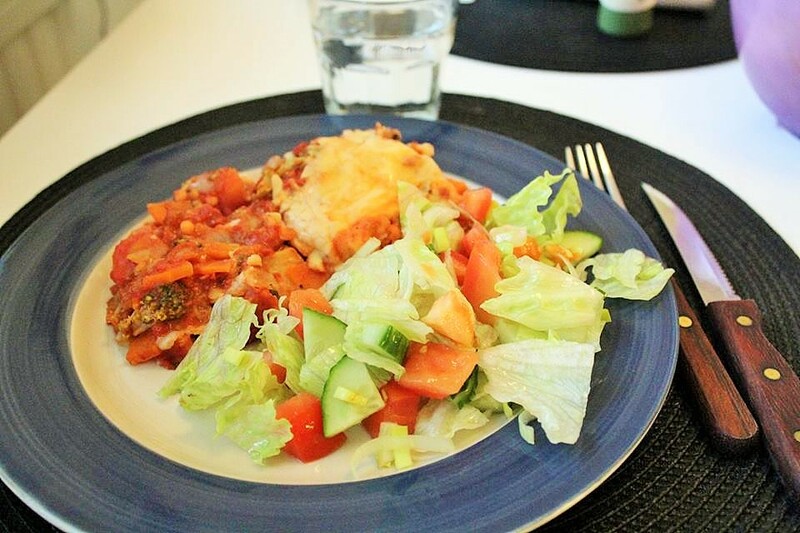 Last night I made my famous lasagne and I also made a vegetarian version for my sister. This one is without any meat substitute and only with vegetables. You can also make it gluten free if you need to. 2. Start by chopping up your onion and carrots. Start frying these first until they soften. 3. Cut broccoli and add it to the frying pan. 4. When the vegetables are soft, add crushed tomatoes, vegetable stock, ketchup, white beans and the lentils. Mix around and bring to boil. 5. Season sauce with basil, oregano, salt and pepper. 6. Lower heat and let the tomato sauce simmer for about 10 minutes. 7. To cook the white sauce; start of with mixing your flour with about 1dl of milk on low heat. Mix until smooth and then add the rest of the milk. Add salt and bring to boil while stirring constantly. 8. Lower the heat and add the grated cheese. Let it melt without boiling. Remember to keep stirring or the sauce will go lumpy. 9. Now use an ovenproof pan. Alternate tomato sauce, lasagne sheets and white sauce in the pan and finish off with sprinkling grated cheese on top. 10. Cook the lasagne in the oven for about 30 minutes or until the lasagne sheets are soft. And enjoy!